It is 5th event of the America’s Cup World Series. The next stage of the America's Cup World Series will be taking place in Venice from 15th to 20th May in front of the magnificent St. Mark’s Square. Aboard the French one-design boat, there will be a switchover between Yann Guichard and Loïck Peyron with the latter back at the helm of the Energy Team AC45. Loïck Peyron, an ambassador of Corum, who arrived in the City of Canals on Tuesday, will be in charge of the boat, while Yann Guichard takes over as coach. Since arriving in Venice, the French team has been based in the old Venice Yacht Club on St. George’s Island. As for the crew, the line-up will be as follows: Loïck Peyron (skipper-helmsman), Arnaud Psarofaghis (wing trimmer), Christophe André (Bowman), Devan Le Bihan (Midbow) and Arnaud Jarlegan (headsail trimmer). Loïck Peyron tells us more about what we can expect during the forthcoming week in Italy. Loïck, how will Energy Team be working in Venice? Loïck Peyron: "It will be more or less the reverse of what we saw in Naples: I’ll be at the helm and Yann will be with us at the start to offer his viewpoint. Exactly as we did in Naples, but with the roles reversed. This is what we had planned, as Yann has a schedule he needs to keep to with his MOD 70 and it’s a good idea to change things, as that means we always keep an open outlook. While we may not have the required funding for the moment, at least we have skilled sailors, who are able to adapt. For me, it is important to take the helm of the AC45 again, in order to continue to feel what it is like and keep up with the ideas. As for the organisation, our little shore team is already busy assembling the boat. I shall be arriving on Tuesday 8th and we will have a good week’s worth of training before racing begins." LP: "Yes, the rules have changed and that’s a good thing. In Naples for example, it was all very sudden with elimination after just one duel. That gave rise to some strange results, with Spithill finishing seventh, for example. In Venice, from the quarter finals, it will be the best of three or in other words two wins if you prefer. To sum up, we shall be sailing much more. Another change is that the fleet race on Super Sunday now has a weighting of three instead of five. That means that the other races during the week will count more. This need for consistency is something that suits us." What do you think about the line-up? Did you get a clearer picture from what you saw in Naples? What are the characteristics of the sailing area in Venice? LP: “In Venice, anything can happen. I know a little about the waters here having raced aboard Oman Sail in an Extreme 40 event and because it was here that the Round Europe races started, when I raced on Fuji. These waters are extremely tricky, as there are so many different parameters and local effects. You really have to grab every opportunity. During the first two days, we’ll be racing outside off the Lido, but for the final three days and Sunday’s big race, we shall be inside just off St. Mark’s Square. This is going to be truly magnificent, even if we know that the race area is going to be complicated to deal with, as it is not very big at all. On an Extreme 40, the race area was already quite small, so on an AC45... But I enjoy this sort of challenge and in this legendary setting, it’s going to be a marvellous experience. Usually, the winds are quite light there and we may well have to fit the wing extensions." So is Energy Team hoping for a place on the podium? LP: "Yes of course. It’s always our goal to be up there on the podium. It has to be. Even if we are a bit behind in terms of training and the means at our disposal, that isn’t going to stop us from aiming high, as anything can happen in these races. We saw that clearly in Naples: the results are extremely close and the standard is getting higher and higher. The top teams and the others are now much closer, which is quite logical and only to be expected. The starts and the five minutes leading up to them are going to be crucial." What is the crew line-up for Energy Team in this first event in Venice? The watch company Corum with the support of Rebecca de Alba has developed and released a new women`s watch model Admiral `s Cup Legend 38, which proceeds from the sale will be donated to the Rebecca de Alba Foundation. Swiss brand Corum has introduced a new model Admiral`s Cup AC-One 45 Double Tourbillon, adding to the Admiral`s Cup collection. The watch brand Corum has pleased its fans with a new men`s watch Ti-Bridge Tourbillon. The watch company Corum has released a new watch Admiral`s Cup Seafender 47 Tourbillon Chronograph, equipped by the in-housed automatic caliber CO 398 with a frequency of 28,000 vibrations per hour. In L'Arc Macau - the largest entertainment center in Macau inaugurated a new Corum boutique. The AC-One collection of the company Corum has been added by the novelty Admiral`s Cup AC-One 45 Chronograph. The famous watch brand Corum presents its new extraordinary creation - the model Admiral`s Cup Legend 42 Meteorite Dual Time. The Swiss watch brand Corum has released a new watch Romvlvs Retrograde Annual Calendar Limited Edition (Ref. 502.510.55/0001 BN67). As part of an unusual art project, the watch brand Corum has presented the watches from the Admiral's Cup AC-One 45 Chronograph Limited Collection Americas collection, dedicated to the countries of North and South America. The Corum Bridges collection is expanded with two exclusive novelties, which combine the watchmaking and jewelry art. The models are available in several versions - a leather strap or a bracelet of gold. The famous company Corum during the watch salon SIAR in Mexico has introduced its new ambassador - an actress and TV presenter Rebecca de Alba. Fans of unique watches and football will appreciate the union of the Corum watch manufacture and FC Zenit. The famous Ti-Bridge collection, presented by the watch company Corum, is replenished the first female model Ti-Bridge Lady. Swiss watchmaker Corum has announced a new model Ceramic Golden Bridge (Ref.B113/01621 - 113.161.15/0001 0000R), made of ceramic. The known company Corum is an elegant model of Admiral's Cup Legend 38, the case of which is made of 18-carat white gold. The famous watch company Corum with the brand Levinson Jewelers has opened a new boutique in Miami. The shop is located in Aventura Mall - the second in the ranking of the most visited shopping centers in the United States. The watch company Corum has pleased its fans with a novelty Admiral's Cup Challenger 44 Chrono Rubber, executed in shades of yellow. For a charity auction Only Watch 2013 watch brand Corum has developed a new model Ti-Bridge 3 Day Power Reserve (Ref: B107/02206 - 107.211.04/0F61 0000). The sides of the model are engraved with images of Asclepius - the Greek god of medicine and healing. The famous watch brand Corum at the annual exhibition, held in Basel (Switzerland), has introduced a novelty Admiral's Cup AC-One 45 Regatta. 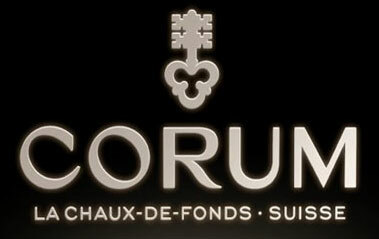 On the occasion of the world’s leading watch industry event, Corum will be inaugurating an over 700 sq.m. brand-new three-floor booth. Ti-Bridge collection of the famous watch brand Corum has recently been updated with a novelty Ti-Bridge Automatic Dual Winder, released in a limited edition - 200 items. In the Dubai Mall - the largest mall in the world, located in Dubai, the famous Swiss company Corum has introduced its original model. The watch company Corum has announced the creation of the replica of the historic model Chargé d'Affaires, released a year after the foundation of the brand and introduced in its first catalog. The name of the independent watchmaker Vincent Calabrese linked to the development of exclusive models that are produced in a single copy. Featuring 360° visibility, as if suspended weightless at the center of the case by a sapphire mainplate and bridges, Manufacture Corum Caliber CO100 is the true star of the new Golden Bridge Tourbillon Panoramique. The famous Swiss company Corum celebrates the 50th anniversary of the Admiral's Cup in France. To present its commemorative novelty Belles Montres Limited Edition Admiral's Cup, intended for the French market, the company Corum has selected the Belles Montres salon. Never before had a minute repeater marked off time by chords and not merely single notes. Such is the feat achieved by the splendid Admiral’s Cup Legend 46 Minute Repeater Acoustica, a world première equipped with four gongs and four hammers, simultaneously striking in pairs. Just ten of these watches will be produced in 2012. The British yachtsman, four-time Olympic champion and ambassador of the known watch company Corum Ben Ainslie has become the winner of the Rolex World Sailor of the Year. The International Sailing Federation (ISAF) in Dublin, Ireland organized the event in November 6. The new bi-color Admiral's Cup Legend 42 by the known Swiss company Corum with a case of red gold or stainless steel, is presented in the same metallic blue, which was used in the original version released in 1983. The novelty, limited to 400 items, is a tribute to this historic watch. Light, but at the same time inspiring reliability and strength, a new watch Admiral's Cup Challenger 48 Day & Night (Ref. 171.951.95/0061 AN12), presented in 2012 by the Swiss watch company Corum, for sure, will be a beacon for business travelers and adventurers. The Swiss company Corum - one of the brands, which are constantly able to surprise everyone: its fans and experts of the watchmaking, and even competitors, are constantly creating luxurious and unique watches. In those hot sunny days, the Swiss watch brand Corum has introduced a new summer collection Admiral's Cup Challenger 44 Chrono Rubber with colorful rubber straps. “Should be seen”! Under this “sauce” can be suggested a new exclusive video clip, which has become a worthy addition of already rich video gallery of the informational portal montre24.com. Corum Energy Team will participate in the Newport Regatta, which will be held from 13 to 15 July. Support of the watch partner this year provides an opportunity for everyone to be aware of the events, as well as to observe the competition every day. Swiss watchmaker Corum jointly by GRIFITH JEWELLER has introduced a new line of limited edition watches, the release of which is timed the 65th anniversary of the famous Brazilian Yacht Club - IATE CLUBE DE SANTOS. CORUM Admiral's Cup Legend 38 Fiancée – is a wrist watch for women, designed specifically for the beautiful and sophisticated ladies. No one is ashamed to wear this watch to a party or luxurious wedding! The company Corum, and it is logical, no way could get around the theme of "marine" watches. A novelty of Corum in 2012 has became Corum Admiral's Cup Seafender 48 Tides watch, which, as noted by the creators, should be a very useful tool for those for whom the conquest of the sea - a profession. The French ENERGY TEAM achieved their first major victory in the America’s Cup World Series this Sunday afternoon in Venice. 45 days, 13 hours, 42 minutes, 53 seconds –it is a new time of the round the world regatta Jules Verne Trophy, which was recorded by the famous timekeeper - Corum. Tourbillon is considered one of the most prestigious complications of the watchmaking world. The company Corum has presented at the annual international exhibition BaselWorld 2012 an achievement of engineering embodied in the Admiral's Cup Legend 42 Tourbillon Micro-Rotor watch. About 30 years ago, the original Admiral's Cup watches became the new watch trend, which set by the company Corum, inspired by sailing. The latest novelty in the Legend series - the Admiral's Cup Legend 42 Annual Calendar watch, is presented at the annual international exhibition BaselWorld 2012. Watchmaker Corum, famous for its daring experiments in the field of watch mechanics and original design, has presented at the annual international exhibition BaselWorld 2012 an original watch Ti-Bridge Power Reserve. At the international exhibition BaselWorld 2012 the watch company Corum presents an Admiral's Cup Legend 42 Chrono watch, which is an organic extension of the collection in 2011. The famous company Corum at the international watch exhibition BaselWorld 2012 has presented its new women's watches Admiral's Cup Legend 38 Mystery Moon – the dial of which, made of natural Indonesian pearl, depicts the fascinating dance of the eternal movement of the sun and moon. In honor of the anniversary of the partnership between the brand and the famous Swiss skier Didier Cuche the watch company Corum presents the new limited watch Admiral's Cup 44 Chrono Centro Didier Cuche, released only in 100 items. The Swiss Corum watch company's ambassador, mountain-skier Didier Cuche has won the downhill race in the German city of Garmisch-Partenkirchen on January, 28. The watch company Corum has released a novelty in Admiral's Cup line. The new item is a surprising interpretation of the legendary model, the watches of which during 50 years embody the spirit of sea trips. Dan Marino - the famous quarterback at No. 13, entered the American football Hall of Fame - became the official ambassador of the watch company Corum. Now, Dan is wearing on his left hand a new Corum 48 mm Seafender Deep Dive with a blue strap. The official face of the Swiss watch company Corum the skier Didier Cuche was named as a sportsman of the Year in Switzerland. 36-year-old athlete is a world champion of the super-giant in 2009 and a silver medalist in Nagano. The watch brand Corum and a crew of catamaran Energy Team in November 2011 took part in the regatta America's Cup World Series, held in San Diego. Brand Corum is an official timekeeper of the Energy Team. A few days has left before the start of the race on the trimarans for the prize of Jules Verne. Banque Populaire team led by Captain Loïc Peyron ready is just waiting for better weather to go on a trip around the world, like the heroes of the novel by Jules Verne. Corum links its name to the prestigious club FC Zenit and is the Official Timekeeper of the blue-white-sky blue football club. To honour this partnership the watch brand has created a dedicated high-end watch, the Admiral’s Cup FC Zenit Chronograph 48, an exclusive chronograph model limited to 40 pieces. The history of Corum dates back to 1955. Chief Executive Director of the watch company Corum Antonio Calce became a shareholder of the company Montres Corum SARL. In 2005, the watch brand Corum started to follow a new strategy, whose implementation is an important milestone in the reconstruction of the brand.